I'm a little late to the party, but since Photo Art Friday is moving to once a month, and I've so missed Bonnie and her Galleria these last few weeks, I really wanted to participate! 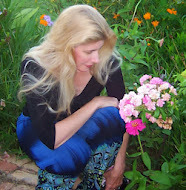 I was enjoying my shady side-garden a couple of weeks ago – playing around with some self-portraits. Taking pictures of my reflection on my computer screen. Enjoyed a lovely day at the Biltmore mansion in Asheville, NC today. I have a lot of beautiful photos to share with you. . . soon! But this shot seemed to fit Bonnie's theme as well. I hope you'll click over to the Gallery and see all the fabulous works "hanging" there! If you'll permit me a little housekeeping: Maureen, I'd be happy to answer your request, but your comment came through as a "no-reply" blogger, so I don't have your email address. Please email me directly, inspiredbyjune@gmail.com, so I can respond to you!